"On this World Autism Awareness Day, let us all play a part in changing attitudes toward persons with autism and in recognizing their rights as citizens, who, like everyone else, are entitled to claim those rights and make decisions for their lives in accordance with their own will and preferences. " In 2008, the Convention on the Rights of Persons with Disabilities entered into force, reaffirming the fundamental principle of universal human rights for all. Its purpose is to promote, protect and ensure the full and equal enjoyment of all human rights and fundamental freedoms by all persons with disabilities, and to promote respect for their inherent dignity. It is a vital tool to foster an inclusive and caring society for all and to ensure that all children and adults with autism can lead full and meaningful lives. The United Nations General Assembly unanimously declared 2 April as World Autism Awareness Day (A/RES/62/139) to highlight the need to help improve the quality of life of those with autism so they can lead full and meaningful lives as an integral part of society. The Autism Society began a nationwide awareness campaign in the early ’70s that was adopted by Congress in 1984 and strengthened by the release of the autism awareness ribbon in 1999. Nearly a quarter century ago, the Autism Society launched a nationwide effort to promote autism awareness, inclusion and self-determination for all, and assure that each person with ASD is provided the opportunity to achieve the highest possible quality of life. This year we want to go beyond simply promoting autism awareness to encouraging friends and collaborators to become partners in the Friends With Autism Initiative movement toward inclusion, employment, advocacy, more welcoming and accommodating communities for people with autism spectrum disorders and their families. On this World Autism Awareness Day and throughout National Autism Awareness Month, let us all play a part in changing attitudes toward persons with autism/autistic people and in recognizing their rights as citizens, who, like everyone else, are entitled to claim those rights and make decisions for their lives in accordance with their own will and preferences. We encourage the Northeast Florida region to unite in as one strong voice to create Sustainable Development, to leave no one behind and ensure that all people can contribute as active members to peaceful and prosperous society. 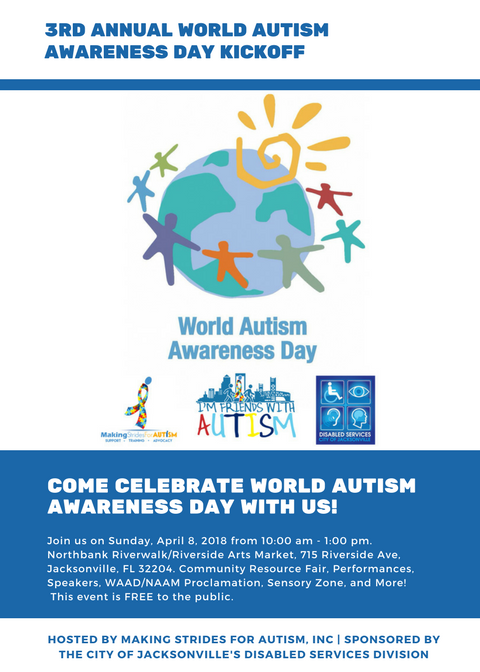 Join us on Sunday, April 7th, 2019 at the Northbank Riverwalk/Riverside Arts Market, 715 Riverside Avenue, Jacksonville, FL from 10:00 am – 1:00 pm in celebration for 2019 World Autism Awareness Day on April 2nd and National Autism Awareness Month! National Autism Awareness Month represents an excellent opportunity to promote autism awareness, autism acceptance and to draw attention to the estimated 24, 911 children and adults living in our region and the tens of thousands facing an autism diagnosis each year. How does Making Strides For Autism, Inc. celebrate it? Sign up for Friends With Autism Magazine to continue sharing ideas on how to make a better community for autism in our region. Share your experience/stories with autism with us! Wear the Friends With Autism T-Shirt! The Friends With Autism Branded Logo soon will most recognized symbol of the autism community in Northeast Florida. Autism prevalence is now one in every 59 children in the United States. With and estimated 24, 911 children and adults living in our region. Show your support for the autism community by wearing the Friends With Autism T-shirt, a badge on your blog or website, or even your Facebook profile picture – and educate the community on the potential of people with autism in our region! To purchase the Friends With Autism T-shirt, click here. Join us on April 7th, 2019 as we celebrate World Autism Awareness Day and Month! The United Nations' 2018 World Autism Awareness Day Observance: "Empowering Women and Girls with Autism"
World Autism Awareness Day/National Autism Awareness Month Proclamation Signed by Mayor Lenny Curry and presented by the City of Jacksonville. Community Resource Fair with over 50 service providers and more details to come! Sponsored by the City of Jacksonville's Disabled Services Division and the Mayor's Disability Council! MS4A will contact you after submission. Have your registered? Register Today on Eventbrite! All registrants will receive a raffle ticket for the prizes and giveaways at the 4th annual World Autism Awareness Kickoff. You must be present to win!